Is BBC News pro-Brexit or anti-Brexit? February 22, 2018, 12:55 p.m.
Last week Andrew Adonis, a former Labour minister and one of the most prominent voices campaigning for Britain to remain in the EU, seemed to allege that the BBC was pro-Brexit, claiming in a tweet that “the Brexit bias is now so deep the BBC doesn’t even realise it”. For many this would be an extraordinary claim, given that the BBC is legally committed to political impartiality. They will also come as a surprise to Leave voters, 45% of whom believe that BBC News is actively anti-Brexit. Among Remain voters, Adonis would appear to be among only 13% that believe BBC News is pro-Brexit – about the same as the proportion that believe it is anti-Brexit (14%). The results form part of a new YouGov study which asked Britons whether they thought a selection of broadcast and print news outlets were pro-Brexit, anti-Brexit or neither. In all cases, large proportions of Brits (41-73%) say they don’t know the outlets’ stance. This is not particularly surprising – despite what journalists may like to think, many people pay a very limited amount of attention to the news and then only from a limited number of sources, certainly not enough to have figured out the editorial stance of all national outlets. Brits are clearest on the stance of the Daily Mail and The Sun, which 40% and 37% respectively identify as being pro-Brexit, and the Guardian which is seen as anti-Brexit by 33%. A further 31% of Brits consider the Express to be pro-Brexit, while BBC News is seen as the second most anti-Brexit news source, at 27%, followed by The Independent on 23%. 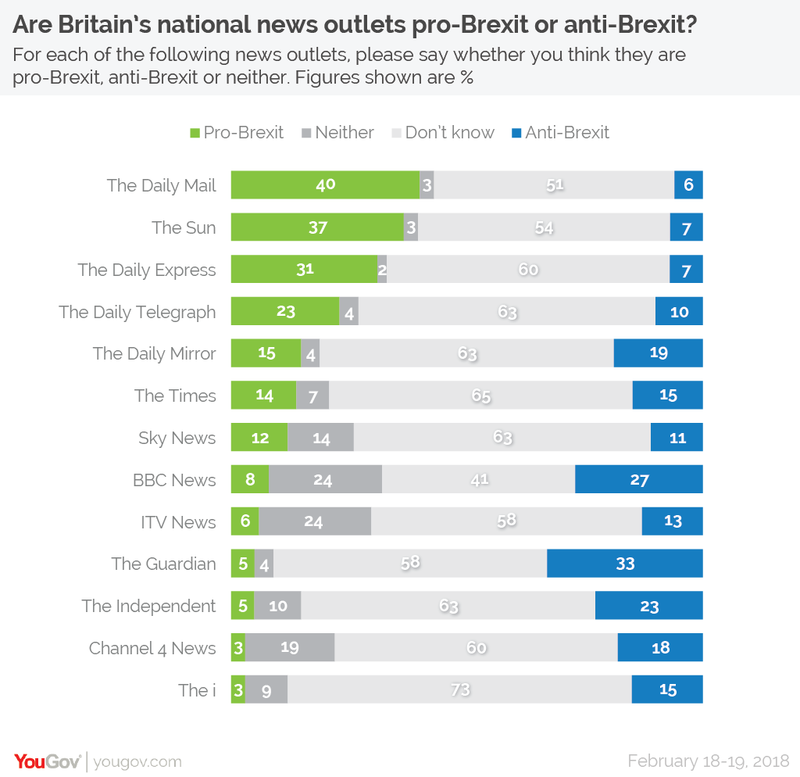 The broadcast outlets in the survey – Sky News, BBC News, ITV News and Channel 4 News – are the most likely to be seen as “neither” pro- nor anti-Brexit, at 14-24%. While there are many notable differences between the perceptions of Remain and Leave voters – their aforementioned views on BBC News being the most pronounced – these can mostly be attributed to the fact that Leave voters are more likely to say they “don’t know” what an outlet’s stance on Brexit is. For instance, the fact that Remain voters are much more likely to think the Daily Mail is pro-Brexit than Leave voters – 53% to 35% – isn’t because Leave voters think the paper is anti-Brexit or neutral, it is simply because they are 12 percentage points more likely to not know the Mail’s stance. In fact, almost all the statistically significant distinctions between the attitudes of Remain and Leave voters that cannot simply be explained by the difference in “don’t know” answers relate to the broadcasters, which Leave voters are more likely to see as anti-Brexit.